Ruth participated in a mission to Israel sponsored by Shurat Hadin, Israel Law Center, that promotes use of "lawfare" to end terrorism by using the international courts to stop the flow of money that funds terrorism and seek financial reparations to its victims. Click here to see the photos. Ruth moderated a webinar “Mediating Wage-and-Hour Class Actions,” in November 2016 for the New York State Bar Association. She will be moderating a CLE panel on the same subject at the January 2017 Annual Meeting in New York. Ruth was quoted in an article about Alternative Dispute Resolution published in the Superlawyers Supplement to the New York Times (March 27, 2016). Click here to read the article. Ruth will be speaking about mediation during a meeting of the Westchester County Bar Association and the Westchester Chapter of the New York State Society of CPAs and CFPs, January 26, 2016 at the Rye Town Hilton. Ruth spoke on February 2, 2015 at a conference on wage-and-hour issues in the Hospitality Industry: “Have We Reached the Tipping Point for Tips?” co-sponsored by the NYC Hospitality Alliance Speaker Series and Fox Rothschild LLP. In the September 2014 Westchester Lawyer magazine, Ruth co-authored an article based on a survey of Westchester labor and employment lawyers regarding factors leading to success in mediation. Click here to read the article. 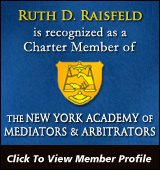 Ruth has been selected as a member of the New York Chapter of the National Academy of Distinguished Neutrals,an association whose membership consists of ADR professionals distinguished by their hands-on experience in the field of civil and commercial conflict resolution, and by their commitment to the practice of alternative dispute resolution. Membership is by invitation only and limited to attorney mediators and arbitrators who have proven experience in the field. All Academy members have been thoroughly peer-reviewed and found to meet stringent practice criteria. Members are amongst the most in-demand neutrals in their respective states, as selected by both peers and local firm references. A book published July 2011 by the New York State Bar Association, entitled “Definitive Creative Impasse-Breaking Techniques in Mediation,” includes a chapter authored by Ruth, “Changing Faces to Change Positions,” which discusses how using different negotiating representatives can lead to successful settlement outcomes. “If You Build It, Will They Come?,” an article Ruth wrote about building a successful mediation practice, was published by the American Bar Association Section of Dispute Resolution in Dispute Resolution Magazine, Summer 2011. Ruth was selected for inclusion in the 2012 and 2013 "Best Lawyers in the Nation,” in the practice area of Mediation. This rating will be published by various periodicals including the U.S. News & World Report. Ruth was selected as a SuperLawyer for the New York Metropolitan Area for 2010, 2011, 2012 and 2013 in the practice area of Alternative Dispute Resolution and as one of the top 25 SuperLawyers in Westchester County. Ruth was recently named to the roster of Labor Arbitrators of the American Arbitration Association and the New York Metropolitan area mediation and arbitration roster of Resolute Systems, LLC. Ruth’s article, “Negotiating Skills: Now More Important Than Ever,” was the lead article in a special ADR supplement to The National Law Journal, November 16, 2009. Click here for the article. University Business Magazine published Ruth’s article, “Addressing Diversity Conflict on Campus,” in its November/December 2009 issues. Click here for article. Ruth was selected as a SuperLawyer for the New York Metropolitan Area 2009 and 2010 in the category of Alternative Dispute Resolution. This honor is conferred on less than 5% of eligible area lawyers. Ruth’s article “Settling Cases: Practical Steps To Becoming a Better Negotiator,” was published in the Outside Counsel section of the New York Law Journal, July 9, 2009. click here. Ruth spoke on the subject of “Mediation” in February 2009 at the Pace Law School New Directions program for “on-ramping” lawyers. Here is what the participants had to say: “very lively presentation,” “funny, interesting [and] informative." In June 2008, Ruth spoke on alternative dispute resolution at the annual conference of the National Association of College and University Attorneys in New York. Ruth's article "Coming to Terms: Mediation of Campus Disputes," was published in the September 2008 issue of University Business Magazine. Taking her preventive training mission to the next step, Ruth Raisfeld has partnered with Judith Gross, Esq. of JG Advisory Services, LLC, a firm that advises hedge funds on compliance issues, in creating a new training module for hedge fund groups that addresses the basics of discrimination, harassment and retaliation laws. This unique program not only presents the regulatory and legal framework as it applies to hedge funds, but also contains case studies that are relevant to the daily work environment in hedge fund offices. This module is accessible from the JG Advisory website at www.jgadvisory.com. Click through on “Training” and view TM5 for this module which is desktop accessible and runs about half hour, longer if you pause to discuss. Please contact Ruth or JG Advisory at 917 375-6852 for further information. 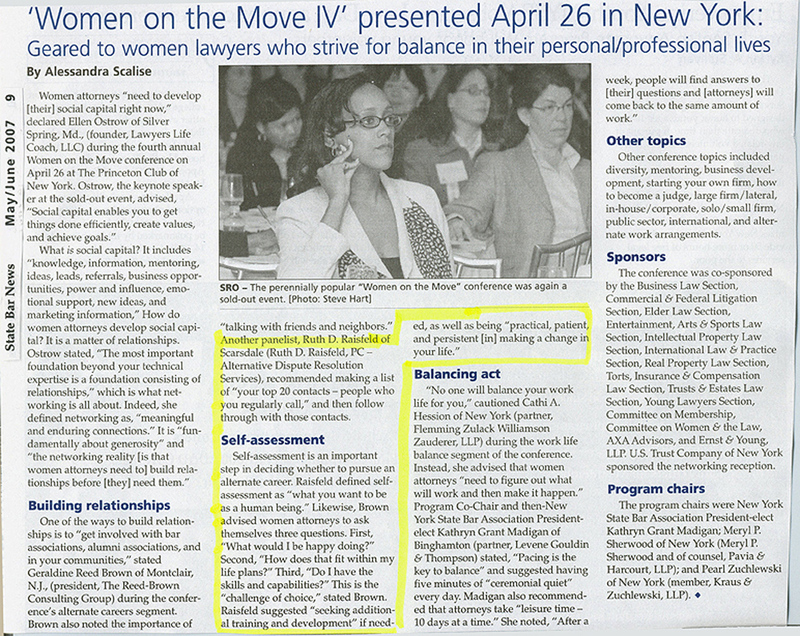 Ruth’s article, “Mediators Help Those Who Help Themselves,” published by New York Law Journal in 2003, was selected for inclusion in the materials distributed by the New York State Unified Court System, Advanced Training for Commercial Division Mediators, a CLE program on April 15, 2008 at the Pace Judicial Institute. Ruth was the only New York area mediator whose article was included in these materials.